Celeste Ciulla, Dee Hoty and Anderson Matthews in “Other Desert Cities” at the Rep. Photo: Jerry Naunheim, Jr. The intriguing script for “Other Desert Cities” won playwright Jon Robin Baitz the Outer Critics Circle Award in 2011 and made him a finalist for the Pulitzer Prize as well. It’s a family melodrama at heart but filled with a lot of humor as clashing political philosophies and family secrets are laid bare. With a highly charged cast and excellent direction, the Repertory Theatre of St. Louis shows us why the play received the accolades. Recovering from a mental breakdown and with a new book under her belt, daughter Brooke returns to her family’s Palm Springs home to break the news to her parents that the book is more of a memoir than the novel she originally intended. Celeste Ciulla is a spitfire as Brooke and appears truly surprised when the galleys of her book are not welcomed with open arms by her mother, father and best buddy brother. Her defense mechanism goes into high gear until she finally breaks her parents (and her Aunt Silda’s) long held silence on the truth of the main focus of her story. Set in 2004 (and in 2010 in the final, short scene), the play rings true on so many levels. 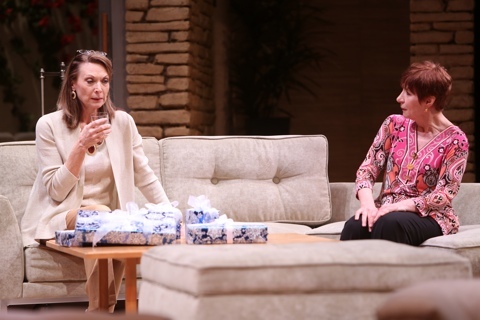 Dee Hoty and Glynis Bell in the Rep’s “Other Desert Cities.” Photo: Jerry Naunheim, Jr. The wonderful Dee Hoty returns to the Rep stage (loved her and the brilliant Lanford Wilson play, “Book Of Days” that premiered at the Rep back in 1999) as the mother, Polly. Her glib and devil-may-care attitude changes quickly when she realizes the family will be thrown- like Christians to the lions- to public scrutiny. Ms. Hoty is a hoot as the Southern California matron whether bouncing around the inspired Michael Ganio set in tennis togs or caftans. She truly makes everything look so effortless as her demeanor makes a quick 180 with brilliant results. As the father, Lyman, Anderson Matthews also brings a superb performance to the forefront. Casually understanding even after the revelation of the book comes to light, his outrage finally comes to a boiling point as he reveals the reality of the circumstances behind the heart of Brooke’s story. Alex Hanna does a great job as Brooke’s vacillating brother, Trip. Although he’s idolized her and comes to her defense early in the play, he seems to weigh the consequences of her action and, in a dynamic confrontation, tells her she may be wrong and hurtfully so. Rounding out this marvelous cast is the always brilliant Glynis Bell as Polly’s sister, Silda. Wisecracking and always just a bit mysterious, she holds a significant piece of the puzzle that is this family and their secrets. Political differences clash between the young and old which adds to the powerful dynamic of “Other Desert Cities” as well as the lifestyles obviously split between the laid back California leisure and the more hectic pace of Brooke’s east coast preference. It all leads to the significance of her “tell all” and how the facts behind her story may sway her decision to publish or not. Alex Hanna and Celeste Ciulla in “Other Desert Cities” at the Repertory Theatre of St. Louis. Photo: Jerry Naunheim, Jr. The sweeping lines of the already mentioned Michael Ganio set featuring a built-in look to the furniture and a massive fireplace dominating the sleek, trendy look of the Palm Springs beach house almost becomes a character unto itself. Phil Monet’s lighting design enhances the feel of the play and the smart David Kay Mickelsen costume design further points out the differences that follow the family dynamic. Steven Woolf’s direction is impeccable. He shows a keen eye for the ebb and flow of Baitz’s script and moves his actors around almost like chess pieces in a tug-of-war for decency and truth. “Other Desert Cities” is a wonderful, enthralling piece of theatre that will captivate you and raise some serious after-theatre conversation. It plays on the MainStage of the Repertory Theatre of St. Louis through March 9th. Give them a call at 314-968-4925 for tickets or more information. Since I was laid up for 16 days with the flu or whatever illness befell me, I did not get to see the Studio production at the Rep, “The Other Place,” until the final week-end of its run. This was a haunting play dealing with mental instability- perhaps dementia, perhaps something else but it was a chance for Kate Levy to bring us a gut-wrenching performance as a scientist and drug rep for a drug designed to combat the very thing she is dealing with. With able support from R. Ward Duffy, Amelia McClain and Clark Scott Carmichael, this Sharr White script is moving and sometimes hard to watch as we delve into a disturbed mind as we try to separate fact from delusion.